Forget cookie cutter marketing. What do your people need before you ask for the sale? Listen to this episode to find out! [8:55] Why “cookie cutter” marketing is my greatest pet peeve! Today’s episode is going to be a little bit of a rant, because it is one of my biggest pet peeves that I see out there in the online space. And I also think it’s one of our really core content… or “core concepts” in The Hirsh Team, because it’s so, so important, and it’s something I have to emphasize so many times with our clients. And that is: Customizing your marketing to your ideal client. Throw away these cookie cutter strategies, like, “So-and-so did this, that means it’ll work for me.” Yes, there are marketing templates out there and things out there that are like, general good practices or formats or templates that will work. But it is so, so important for you to keep in mind. And every time you hear marketing advice, ask yourself, “What audience and what niche was this for, was this created for?” Because, the business-to-business space is so much different than the business-to-consumer selling space. And the mistake I see people make is they see business-to-business marketers, people who are selling to other business owners and entrepreneurs, create like, “here is how you sell this and make this much money and get this much success,” create these templated plans… And then they go and try and apply it to their business-to-consumer selling business. And it doesn’t work, it totally fails, and they think it’s them and they don’t understand why. It’s because you can’t take a cookie cutter strategy and apply it to any niche. Even within our client roster, we work with, I would say … 80% of people are in the B2B space and 20% are in the B2C. We work with both, but because we get so many referrals in the B2B, that’s just who we work with a lot. But, even within there, there’s such a wide variety. Every time you create a marketing plan, you can use templates, you can use best practices, you can say like, “I know a webinar is the best way for me to deliver this information,” or, “I need people to apply and get on a call with my team,” whatever it is… That’s fine, but also, don’t lose sight of who actually is your client? And what’s the experience that they will need? And – this is so important – how much nurturing are they going to need before the sale? Here’s the example. In the B2B space, it’s a lot more money to get people in the door initially. 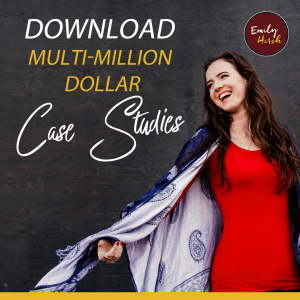 To get somebody signed up for a webinar, to get somebody on an application, to get somebody in the top of your funnel…it’s going to cost more. But once you get them in there, they usually convert a lot quicker and faster… quicker and easier as a sale, because they’re entrepreneurs, because they can write it off as a business expense, because they make decisions in a snap of a finger. That’s who they are, right? That’s your customer, business owners. In the business-to-consumer space, it’s usually a lot cheaper to get them in the door for your free offering, for your top of your funnel webinar/PDF/opt-in/whatever. It’s way easier to get them to sign up, cheaper as well, but way harder for them to [buy]. Your actual sales conversion will be lower, because they’re consumers, because they’ll think a lot. They’re not business owners. They’re the average American or just a consumer who isn’t like, “I’m going to write this off as a business expense and implement it tomorrow, because I’m a crazy entrepreneur.” They’re just a regular person. Of course, there’s a lot of niches of “regular people” and consumers, but it is so different. Here’s the key thing, and the key difference, in marketing in the two areas, is that the consumers need a lot more… business-to-consumer marketing needs a lot more nurturing and time in between your first touchpoint with that cold lead and when you ask for that sale. A lot of times what happens is someone in the business-to-consumer space throws out a webinar, and they’re like, “Well, Russell Brunson said I can convert this webinar at 10 percent.” And they throw it out there, and it does like crap, because the webinar was the first touch point that the person had with them, and so they’re not going to buy and they forget about that lead. The key here is building in nurturing. Maybe it’s, first of all having nurturing before the webinar, but building in nurturing so they have several touchpoints before they’re asked to buy the product, will win over those consumers. In the B2B space, you can do a cold traffic to a webinar to a sale. That works still. But in the business-to-consumer space, I’ve not seen that work very many times, unless it’s a very low ticket, low priced offer. But they need the nurturing. We had originally had the strategy that she was going to do a free challenge. She’s like, “I’m going to do this paid challenge. It’s way better. They’re committed.” And I was like, “Wait a second, what’s the industry that she’s doing this for?” She’s like, “Oh, business coaching. She’s doing it for other business owners who want to start their own business.” And I’m like, “Right. And what’s your industry?” She’s in health coaching, she has programs around weight loss and nutrition. And I’m like, “Too different! If you tell people, ‘Pay for my challenge,’ that’s the product they’re going to buy. Another example is, we have a client who sells to teachers. Teachers will convert super cheap into the top of the funnel. Like super cheap, $1 leads to get them to watch a webinar. But usually, a lower sales conversion, and you also can’t say like, “Here, you’re a teacher, buy this $1,000 product.” They don’t have the money to do that. You have to build in the nurturing, and you have to have lots … Usually, the clients who have success have a few different, lower-priced products to offer teachers, but same thing … When we were building out this funnel and this ad strategy for this client, who we knew was targeting teachers, we knew like, “We’re not going to throw a bunch of marketing emails and spammy-seeming emails” … I mean, we never want spammy-seeming emails, but … For example, our sales sequence is usually 5-6 emails, right? For teachers, we’re going to make it 3-4, because they’re probably going to read their email and open their email, but if they get five or six, you’re on the verge of super annoying to them. Those emails also needed to have some value in them so they actually connected with the teacher and started to build a relationship through the emails, versus just going straight to the sell, which … Entrepreneurs are like, “Cut to the chase,” and they don’t read all their emails, so if you send 5-6, they’ll probably see one or two. That is the key, is … There’s way too many cookie cutter strategies being taught out there by marketers, because it worked for them and a few of their clients … and [it’s] trying to be applied to several different industries. It drives me crazy. 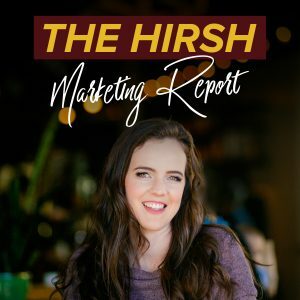 And that’s why it’s super important … Step One in The Hirsh Process is to strategize, and to understand those customers and understand your customer journey and understand how you’re going to achieve success with your marketing, before you move onto the next step. If you want help with that custom strategy, if you feel like your strategy needs to be analyzed because it’s not working or it doesn’t exist, go to HelpMyStrategy.com and book in a call with the Hirsh Team.